I really liked the VOILE CARDS Christina made and also the tutorials are wonderful. 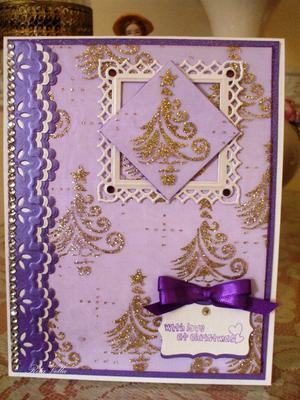 I happened to come across this very pretty purple voile with gold Christmas trees and I knew I had to make a card with it. I also wanted something special and different to send to a dear friend . I made it in the hinged style which I learned from Christina's tutorials. 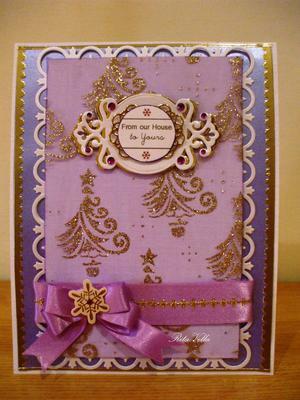 Products used: White cardstock for base Purple glitter card matt and the purple voile is wrapped around white cardstock. Purple and white Centura pearl for the border. Dies used are Spellbinders Captivating squares and edgeabilities. Crafts too die for the sentiment. Stamp was a free gift with a mag I had and never used up till now. Ink used is Papermania and ribbon and hot fix crystals from my stash. I too liked the voile and it looks so special on a card. It is a relatively cheap addition that gives a spectacular effect and is sure to please the person lucky enough to get a card from you. If you would like to know more about this style of card or adding the voile then take a look in the Video Tutorials for some really cool ideas. Then get busy and make some of these wonderful cards for yourself. Another card I made from this lovely voile which I will give to my daughter. This card is also 15cm by 19cm. It is done in the hinged style which Christina has me hooked on at the moment. I really like this style. Thank you Christina for your tutorials, I have learned so much from them. Products used are Spellbinders Fleur di Lys rectangles for the Lacey border behind the voile. Parisian accents and Stately circles for the sentiment. Ribbon, snowflake and crystals from stash, also added some peel off borders around the edges and across the ribbon. This card is really lovely and I love how you have taken the ideas and used them to suit your own design. The voile you have used is gorgeous and fits the card really well. I am sure that your daughter is going to love it and will keep it for along time to come.